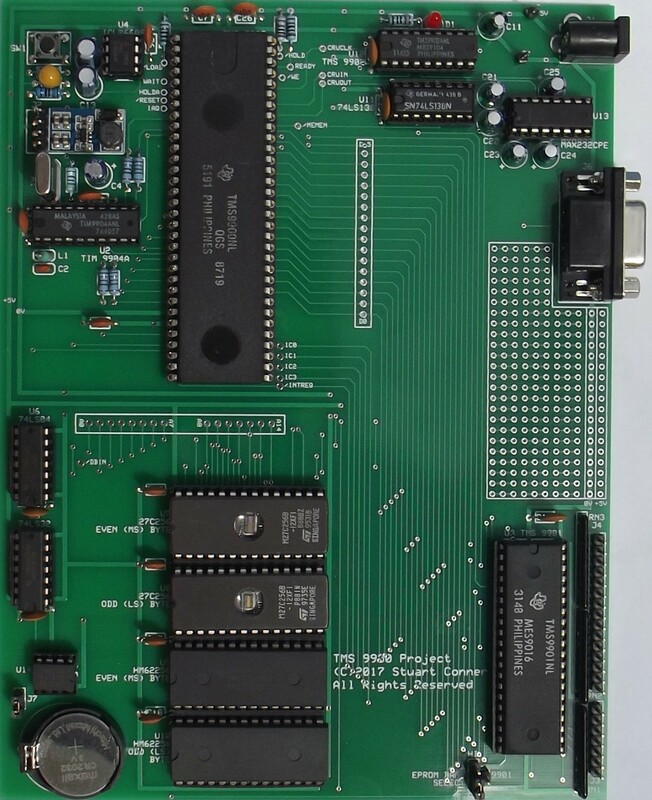 This TMS 9900 system project provides a similar, minimal system to my TMS 9995 breadboard project, but using the Texas Instruments first-generation TMS 9900 16-bit microprocessor. The system can be built either on a breadboard, or on a PCB (contact me if you want a PCB - I'll order them in small batches once a couple of people have expressed an interest). The microcomputer is designed to interface with a Terminal program running on a PC, and run a system monitor, BASIC interpreter and Forth interpreter from EPROM - note though that there is no facility to load or save programs on this simple system except by downloading or uploading them over the serial interface. Pre-programmed EPROMs are available for purchase for users who do not have the facilities to program their own. The breadboard system is easy to modify, expand and experiment with as the user wishes. On the PCB, take-off points are included for all the main signals and the I/O ports to enable the system to be expanded off the board. The PCB also includes a small prototyping area. This web page provides the specification, circuit diagram and technical description of the system. 16-bit TMS 9900 microprocessor running at 3 MHz. TMS 9901 Programmable Systems Interface. 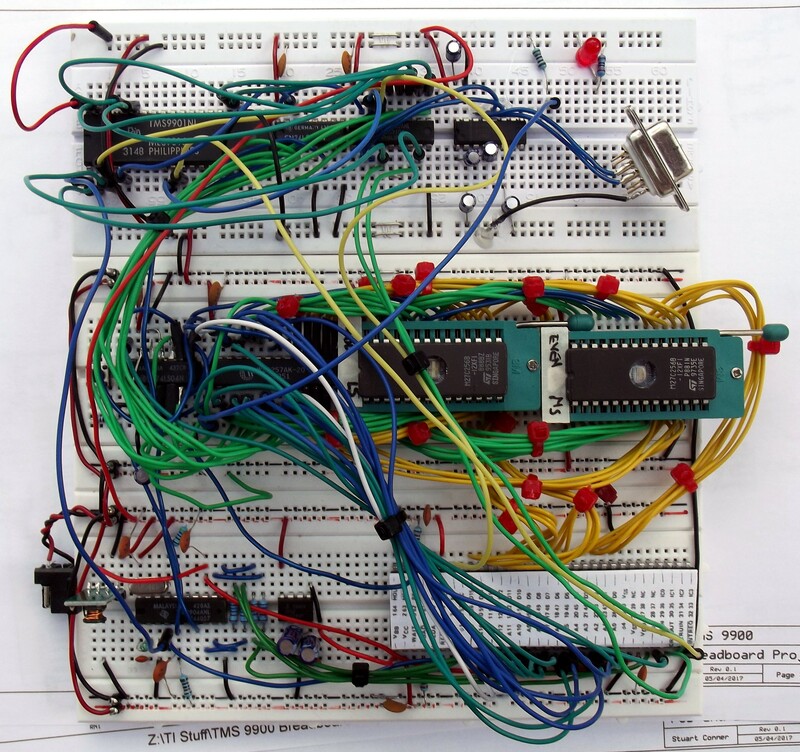 32K + 32K byte (two banks) EPROM, bank selectable through jumper or CRU output bit. 32K + 32K byte (two banks) battery-backed static RAM, bank selectable through CRU output bit. Single +5V @ 300mA power supply requirement. A circuit diagram for the project is available here, and a high resolution photograph of the breadboard system here and the PCB here. The following description should be read in conjunction with the component datasheets, links to which are given in the References section below. TIM 9904A clock generator U2 generates the four-phase clock required by the TMS 9900 processor U1. The frequency of the internal oscillator is established by 12 MHz crystal X1. The LC circuit formed by inductor L1 and capacitor C2 connected across the tank inputs of U2 is tuned to the crystal fundamental frequency. Series resistors R1 - R4 minimise overshoot and undershoot on the 12V clock lines. The Æ3 clock, at TTL signal levels, is also used as a timing clock for the TMS 9901 Programmable Systems Interface (PSI) U3 and the TMS 9902 Asynchronous Communications Controller (ACC) U12. Resistor R5 and capacitor C1 provide a 'power on reset' input to the D-type flip-flop within U2. The flip-flop output, FFQ, is fed to the active-low reset inputs of the processor U1 and PSI U3. Switch SW1 and resistor R6 provide a manual reset function. Diode D2 rapidly discharges C1 when power is removed such that a reset pulse is still produced if power is reapplied quickly. READY, as the access times for the EPROM and RAM are sufficient for the processor to run with no wait states. /LOAD, as this non-maskable interrupt is not used. EPROMs U7, U8 and static RAMs U9, U10 are connected directly to the processor address and data buses. Note that at the time Texas Instruments labelled their address and data bus lines the opposite way round to the rest of the industry, so the low numbered processor address and data bus lines are connected to the high numbered EPROM and RAM address and data bus lines, and the high numbered processor lines are connected to the low numbered EPROM and RAM lines. The EPROM and RAM /OE (Output Enable) inputs are connected to the processor DBIN output, which is inverted by U6b to form /DBIN. When /DBIN is active low, the processor has disabled its data bus output buffers to allow external memory to output data onto the data bus. The EPROM /CE (Chip Enable) input is derived by ORing address bus line A0 with the processor /MEMEN (Memory Enable) output, such that the EPROM is enabled during memory cycles in the address range >0000 - >7FFF. The RAM /CE input is derived in a similar way by inverting address bus line A0 and ORing it with /MEMEN such that RAM is enabled during memory cycles in the address range >8000 - >FFFF. The RAM most-significant (MS) address bit A14 is connected to the PSI U3 pin P1. After a reset, all the programmable pins on U3 are programmed as inputs, and P0 to P6 are pulled low by resistor network RN1, so by default the lower 32K bank of RAM is used. By writing a logic 1 to pin P1 through the Communications Register Unit (CRU) interface, the upper 32K bank of RAM can be selected (although care must be taken to synchronise the switch as the program's workspace registers will change to whatever values are in the corresponding memory addresses in the upper bank of RAM). The address bit can be tied low or high to manually select either the lower or upper 32K bank of EPROM for access. This is useful for selecting between two different program images when booting the system. The address bit can be connected to the PSI U3 pin P0. This enables the lower or upper 32K bank of EPROM to be selected programmatically, in the same way as the RAM memory banks described above. The lower 32K bank of EPROM is selected by default at system reset. 3-to-8 line decoder U11 decodes address bus lines A7, A8 and A9 during CRU input/output cycles when /MEMEN is high to provide chip enable signals for 8 blocks of 32 bits of CRU address space. Output /Y0 is active low when addressing CRU bits 0 - 31, /Y1 is active when addressing bits 32 - 63, and so on. TMS 9902 ACC U12 is a CRU peripheral device which provides the interface between the processor and a serial, asynchronous, RS‑232 communications channel. The connection to address decoder U11 maps the device to processor CRU address bits 0 - 31 (equating to a CRU base address of >0000). RS‑232 driver/receiver U13 generates ±10V supplies from the single +5V supply and provides signal level conversion between RS‑232 signal levels (±3V to ±25V) and the TTL signal levels used by U12. A simple 3-wire RS‑232 interface is implemented through connector J6. TMS 9901 PSI U3 is another CRU peripheral device which provides interrupt control, I/O ports, and an interval timer/clock. The system interface consists of 22 pins divided into 3 groups. The 6 pins in Group 1 (/INT1 - /INT6) are normally dedicated to interrupt inputs, but may also be used as input ports. Group 2 (/INT7_P15 - /INT15_P7) consists of 9 pins which can be individually programmed as interrupt inputs, input ports or output ports. The remaining 7 pins which comprise Group 3 (P0 - P6) are dedicated as individually programmable I/O ports. After a reset, all the programmable pins are programmed as inputs. The pins in Groups 1 and 2 are pulled high by resistor networks RN2 and RN3, and are made available on connector J4. The pins in Group 3 are pulled low by resistor network RN1, and are made available on connector J3. Two pins in Group 3 are used for one of the RAM and EPROM address bits, as described above. When one or more pins are programmed as interrupt inputs, the interrupt section of the TMS 9901 prioritises and encodes the highest priority active interrupt and outputs this code to the processor on the IC0 - IC3 lines along with an active /INTREQ signal. The connection to address decoder U11 maps the TMS 9901 to a CRU base address of >0040. The circuit requires a single +5V regulated supply, which is input through connector J1. Capacitor C11 provides power supply smoothing. LED D1 provide a 'power on' indication, with resistor R8 limiting the current through the LED. Most of the components operate from this single +5V power supply, with the exception of the processor U1 which also requires -5V and +12V supplies, and the clock generator U2 which also requires a +12V supply. The -5V supply is generated from the +5V supply by voltage converter U4. For the +12V supply, a +5V to +12V step up converter module is used which is soldered to connector J2. The supply to individual ICs is decoupled by capacitors C3 - C10, C14 - C20 and C26. The two RAM ICs are powered through the non-volatile memory controller U14 which provides battery backup and write-protects the RAMs when the Vcc supply is out of tolerance. System monitor. The project uses a modified version of the TIBUG system monitor from TI's TM 990 range of microcomputer modules and the EVMBUG system monitor from TI's TMS 9995 Evaluation Module. TIBUG and EVMBUG are described on this page. 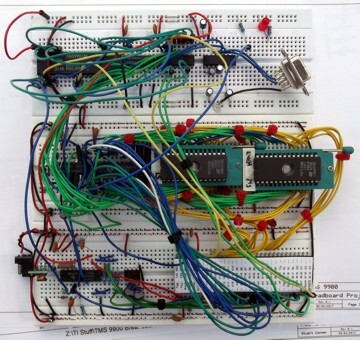 A combined EPROM binary image is provided which contains the EVMBUG system monitor and Cortex BASIC in the lower 32K bank, and the TIBUG system monitor and Cortex BASIC in the upper 32K bank. 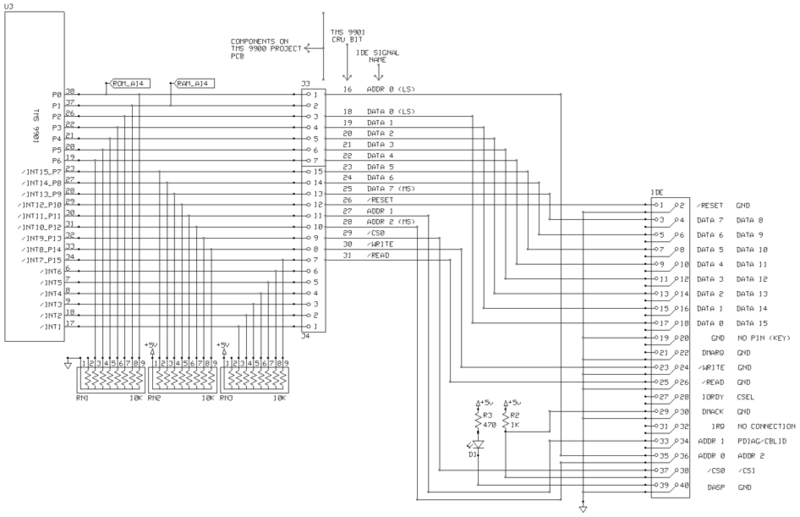 The required EPROM bank is selected using jumper J5 as detailed here. The link below is to a zip file which contains two EPROM images - one image for the even (most significant) byte, and one for the odd (least significant) byte. Which EPROM goes in which socket is clearly marked on the PCB. Link to TIBUG, EVMBUG system monitor and Cortex BASIC EPROM image here. An EPROM image is provided which contains the EVMBUG system monitor and Forth. The EPROM bank select jumper must be set to the 'LO' position. Observe carefully the orientation of the ICs, resistor networks and capacitors - they are not all fitted the same way round. There are various styles of battery holder available with slightly different pin sizes and spacing. The pin holes in the PCB are quite tight. It may be necessary to bend and/or slightly crush the battery holder pins to get them to fit. Connect pin 5 to pin 6. Connect pin 8 to pin 1. 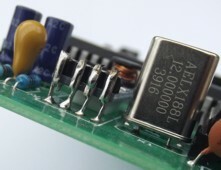 The +12V converter module is mounted on the PCB on two small stacked, double-sided adhesive foam pads, and the bent-over pins connected to the board using some component wire offcuts, as shown in the close-up photo below. To connect the system to a 9-pin serial port on a PC, a serial cable with male and female connectors is required, with the following pins connected (as a minimum): 2‑2, 3‑3, 5‑5. If using a serial-USB adaptor, you should be able to connect the serial adaptor to the system directly. With the version of Cortex BASIC supplied with EVMBUG, the BASIC interpreter code is copied from EPROM to RAM and then run from RAM. This leaves 3K of memory free for program storage, but this is often sufficient for 'tinkering', and it is possible to tweak the BASIC interpreter itself if required as it is resident in RAM. Set the EPROM bank select jumper J5 to the 'LO' position to select the lower 32K bank to use this configuration. As BASIC programs are stored in the battery-backed RAM, options are provided in the boot menu (described below) to select Cortex BASIC and retain the current program in RAM (which can be subsequently edited, listed or run), and to select Cortex BASIC and automatically run the current program in RAM. The boot code checks the state of the TMS 9901 interface pin connected to connector J4 pin 1 (the pin nearest the serial port connector) and if it has been pulled low, the boot code automatically selects Cortex BASIC and runs the current program in RAM. This gives the ability to automatically run a BASIC program at power-on or system reset. Press the number key indicated according to the option required. If you are new to programming a single board computer of this type, the user manual for the TM 990/100M microcomputer provides a good introduction to the processor architecture and concepts. The commands associated with text and graphics displays will be accepted and will execute, but as the system does not include a video display processor, nothing will be seen. Memory addresses mentioned in the user guide and the memory maps are not correct for the TMS 9900 implementation. I can provide memory usage details if required. The Forth interpreter is based on the fig-FORTH 9900 Release 1.0 (March 1981). The source code is available here (the TMS 9900 implementation is slightly modified in terms of the memory pointers used and the input/output routines). Forth is programmed in the EPROM along with a slightly modified version of the EVMBUG monitor. When the system is reset, a menu is displayed: press 1 to run the EVMBUG monitor, or press 2 to run Forth. Various Forth tutorials are available here. Note that different versions of Forth support slightly different dictionaries so you might find some examples in the tutorials that will not work on the TMS 9900 implementation. This is a little project to implement an IDE interface through a TMS 9901 programmable systems interface IC, with the software to read and write to the IDE drive written in Cortex BASIC. At the moment there is no file system as such, it only reads and writes directly to sectors on the drive, so it is perhaps a solution looking for a problem - a pseudo-vintage data logger perhaps! On the TMS 9900 PCB System, the programmable pins on the 9901 can be easily accessed through the two header connectors. The circuit diagram is shown below. On the PCB, some of the 9901 pins are connected to pull-up resistors and some to pull-down resistors. When the 9901 is reset, all the pins are programmed as inputs, so their default logic state is determined by the pull-up/down resistors. When deciding how to connect the IDE interface, it is important that the active low control signals /RESET, /CS0, /READ and /WRITE are connected to pins on the 9901 that default to a high logic level such that the IDE drive defaults to an 'inactive' state. The eight data lines are connected to pins accessed through sequential CRU bits in the 9901 such that they can be set and read using multi-bit CRU instructions. The project is primarily focussed on Compact Flash IDE drives which can be set to operate in an 8-bit mode - two 8-bit read/write operations take place for each 16-bit data transfer. Although the hardware is also compatible with hard drives, they do not support the 8-bit mode, which wastes half the data in each 512-byte sector. The 8-bit mode feature is selected on a Compact Flash drive by writing >01 to the Feature register (register 1) then the >EF 'Set Feature' command to the Command register (register 7). As stated previously, when the 9901 is reset, all the pins are programmed as inputs. Writing to a pin programs it as an output, and it remains as an output until the 9901 is reset - either a hardware reset, or a software reset triggered by writing to a specific CRU bit. Therefore when reading a sector from the drive, the various registers on the drive are first programmed (by selecting a register on the 3-bit address bus then writing a value on the data bus), then the 9901 has to undergo a software reset such that the data bus pins can then be used as inputs to read the data from the sector selected on the drive. The software does not do any 'drive busy' checks on the drive before performing operations. The couple of CF cards I have tried seem to have no problems keeping up with an elderly 3 MHz processor running a BASIC interpreter! Likewise there is no error detection - if it works it works, it if doesn't it doesn't! The Cortex BASIC software listing is shown below, along with an example 'session' writing data from memory to a sector and reading the data back again. The program provides feedback on how the IDE drive registers are being programmed for each operation. 220 PRINT "SELECT FROM THE FOLLOWING OPTIONS:"
230 PRINT "(1) WRITE A SECTOR WITH A SPECIFIED BYTE"
240 PRINT "(2) WRITE A SECTOR WITH DATA FROM MEMORY"
250 PRINT "(3) READ AND DISPLAY A SECTOR"
820 PRINT "READING SECTOR (ALL VALUES IN HEX):"
1000 PRINT "RESETTING IDE DRIVE"
1080 PRINT "RESETTING TMS 9901"
1590 PRINT "SETTING DATA BUS TO";DAT;" (";#;DAT;"H)"
1660 PRINT "SELECTING MASTER DRIVE (REG 6 AND DATA)"
1750 PRINT "SELECTING 8-BIT MODE (REG 1 AND DATA, REG 7 AND DATA)"
1870 PRINT "SETTING NUMBER OF SECTORS TO TRANSFER TO";NS;" (REG 2 AND DATA)"
1960 PRINT "SETTING SECTOR ADDRESS TO";SA;" (REG 3 AND DATA, REG 4 AND DATA, REG 5 AND DATA)"